Amy Colbert, 27, was posthumously promoted to staff sergeant. 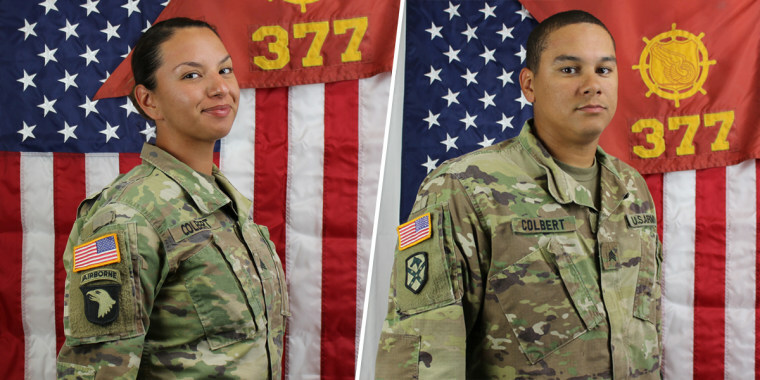 A Fort Bliss soldier was charged with murdering his wife on the base in El Paso, Texas, only a week after she returned from a combat tour in Kuwait, military officials said Monday. Sgt. Lance Colbert is accused of killing Staff Sgt. Amy Colbert on April 6, according to a Fort Bliss spokesman. Lance Colbert, 29, is charged with murder, communicating threats, stalking and indecent language under the Uniformed Code of Military Justice. He is in military custody awaiting a preliminary court hearing. Amy Colbert, 27, had returned March 31 from an eight-month combat tour in Kuwait. She was a heavy vehicle operator but was serving as a chemical equipment repairer. The mother of two was posthumously promoted to staff sergeant. She joined the U.S. Army in 2011, less than a year after graduating high school, according to an obituary under her maiden name, Contreras. She is survived by her two daughters, her parents, and her two brothers.